Dr. Chang and students from Dr. Uhalde’s HIST 1222 prepare for a LARP game. 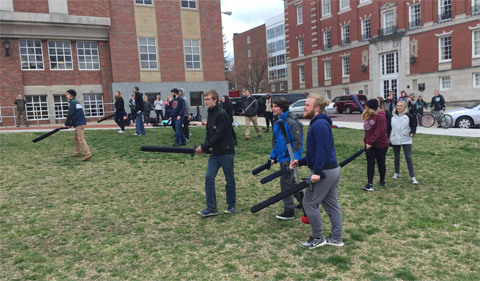 “Keep LARPing!” was one student’s reaction to a new component of HIST 1222 Medieval History in Film and Literature this spring. Dr. Kevin Uhalde, Associate Professor of History, has taught this introductory course in history and medievalism for many years. The syllabus contained mostly historical texts and films such as Passion of Joan of Arc, Seventh Seal, and Monty Python and the Holy Grail. Recently, though, other popular media have been included. This spring he added a new component—LARPing, or live-action role playing game, a form of role-playing game where participants physically enact their characters, with help from Dr. Edmond Chang, Assistant Professor of English, who joined Ohio University in fall 2017. Upon learning about Chang’s interest in bringing gaming, fantasy, and especially LARP into the classroom, Uhalde asked him to consider visiting HIST 1222. “Dr. Chang’s background as a scholar, author, and player in all sorts of play and gaming reaches many students where they experience the Middle Ages most,” Uhalde says. The two professors exchanged numerous emails and met several times over the winter, preparing to incorporate LARPing into Uhalde’s course in a way that students would draw meaning from and enjoy. The following week, the class met Chang on a small grassy area on campus where he guided them through a demonstration of his self-created LARP game Archaea. Read Chang’s reflections on the experience and view images and videos on his blog. “The world of Archaea is a well-crafted and mesmerizing place. As someone who is a Creative Writing major, cosplayer, and D&D fanatic, I feel that this event helped shape many of my views and inspired me to work harder at developing my own fantasy projects. I am even taking Professor Chang’s English 2200 this fall thanks to this LARPing experience,” noted Emma Keefer, a first-year English Creative Writing major. Live action role playing in history ‘class. 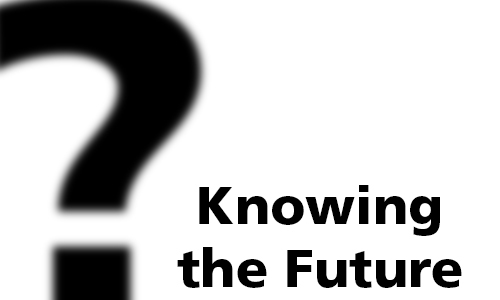 Students responded positively to both the topic and the experience. 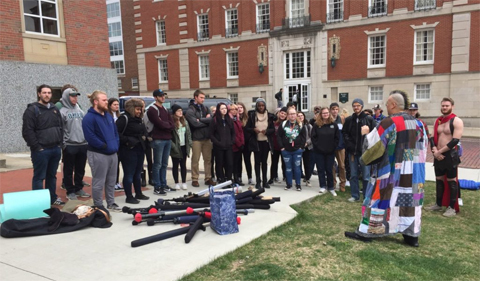 HIST 1220 typically draws a cross-section of majors, which is reflected in the following student reflections on the LARP demonstration. Nat Robbins, a first-year Biological Sciences Pre-Professional major chose to not participate directly, yet she too enjoyed the class experience. Chang holds a Ph.D. in English from the University of Washington. He is currently working on a book about queerness and digital games—the subject of most of his recent publications and conference presentations. “My recent work thinks about video games and ways in which the technology that undergirds them is always already normative. I’ve termed this phenomenon ‘techno-normativity,’ which is an extension of heteronormativity,” he remarks. Chang’s regular course offerings include ENG 2010 Prose Fiction and Nonfiction and ENG 3230 American Literature 1918—Present. ENG 2100: Critical Approaches to Popular Literature: “Why are Americans Afraid of Dragons?” Critical Approaches to Reading, Writing, and Playing Fantasy (which will include LARPing as part of the class).